Torrent Oil LLC is an independent oil and natural gas company based in Houston, Texas. Our work is centered around our strategy to reinvigorate assets with new technologies, new people and an entrepreneurial spirit. We are committed to being responsible in our efforts in producing oil and gas. This includes the safety of not only our employees, but also the people and environment that surround us. Value creation through the acquisition and exploitation of challenging, mature, legacy properties. We make a diligent effort to surround our organization with vendors and people that share our same level of honor, pride, and enthusiasm to produce results. If you have any interest or questions regarding Torrent Oil, owner or investor relations, please feel free to contact us! We currently have several open positions, please inquire within. Torrent Oil is centered around exploitation, development and production of oil & gas. 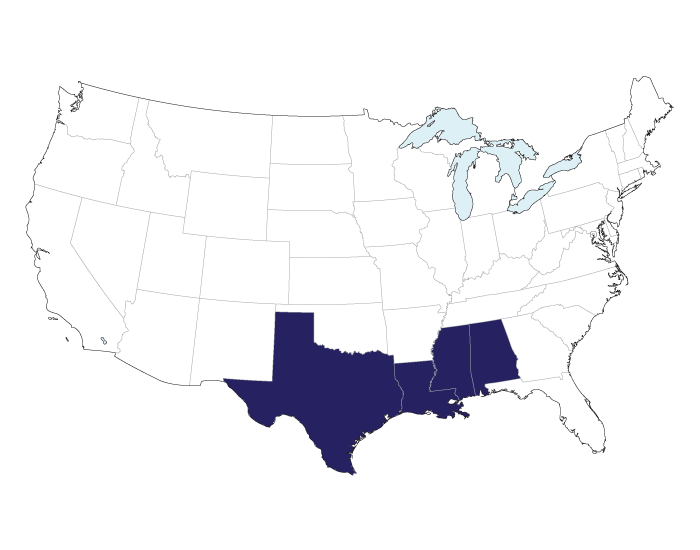 Our area of operations is primarily focused within the Gulf Coast region. The organization is intimately knowledgeable and possesses a deep understanding of how to create opportunities for incremental present and future growth. We are proud to provide a positive and exciting presence within the energy sector. As CEO and President of Torrent Oil, Greg Wachel is a 17 year veteran of Hilcorp Energy Company, with recent roles as Chief Reservoir Engineer and Asset Team Leader of multiple operating areas. Greg’s expertise is the acquisition, exploitation and management of challenging, mature, legacy oil and gas fields in the Gulf Coast area. Mr. Wachel holds a B.S. in Civil Engineering and a M.S. in Petroleum Engineering, both from The University of Texas at Austin. Mr. deLaunay is an energy executive with 16 years of experience in the development and production of oil and gas fields in North America. Prior to co-founding Torrent, he served in Land, Business Development, and EHS roles over a 12-year career at a leading private energy company. He has broad experience in asset exploration, exploitation, A&D, land, joint ventures, government relations, and the managing of relationships with industry partners and mineral / surface owners. He graduated with a Bachelor of Science from Louisiana State University and has a Master of Business Administration with a concentration in Finance from The University of Houston.